BROADWAY, a name that denotes some of the most beautiful, beloved, and well-known songs ever written. Climb Every Mountain, Till There Was You, From This Moment On, I Got Sun in the Morning, The Impossible Dream, and more. 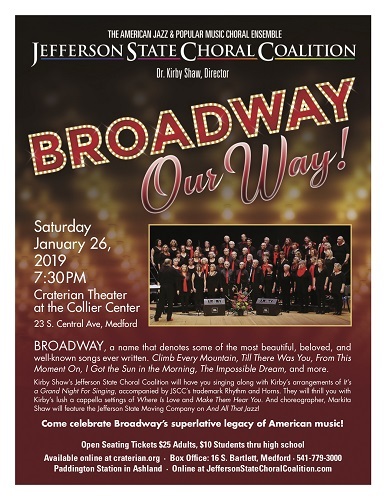 Kirby Shaw’s Jefferson State Choral Coalition will have you singing along with Kirby’s arrangements of It’s a Grand Night For Singing, accompanied by JSCC’s trademark Rhythm and Horns. They will thrill you with Kirby’s lush a cappella setting of Where Is love and Make Them Hear You. And choreographer, Markita Shaw will feature the Jefferson State Moving Company and All That Jazz! Come celebrate Boradway’s superlative legacy of American music!